"There were just six months to design the first version of Euro Fighter from scratch", Josef Herzog, engineer at Gerstlauer, remembers. In spring of 2003 this ride was presented to the public at BonBon Land, Denmark, and less than 12 months later the second version will follow. Typhoon uses the same cars, brakes and drives. Calculations were done, hundreds of single component graphs made using a computer aided, technical drawing program - in short CAD - and suppliers searched. "We studied dozens of product catalogs and had many talks with potential suppliers before we found the right chain for our lift tower, for example", says Siegfried Gerstlauer. For Gerstlauer Elektro GmbH building a roller coaster is everyday business, for other companies a very exceptional venture. A roller coaster wants to be well thought through: Without production drawings and a documentation of the calculations none such ride can go into service. Neither can a strict coordination be missing. So the first step of each project is creating a digest of the schedule, combining causal contexts and the temporal workflow: So the track can only be produced as soon as all the calculations are finished. And for designing the layout a defined interface between the car and the track has to be agreed on: The engineers have to clarify which elements and features can be negotiated by the cars. "Depending on the workload we assign tasks to external engineering offices", Siegfried Gerstlauer explains. Regarding the output of six coasters for the 2004 season - a new record high in the history of the company - the tasks have to be well allocated to the 30 employees. At the beginning of the design process stands the basic idea regarding the layout like it was described in the last issue of this series. Afterwards the design of the car is made, including construction and engineering of the chassis. Service strength certificates play a leading role when designing the components. There is a mathematical stability proof to be adduced for each component before production can start. The adequate state of the art is outlined in standards like the Deutsche Industrie Norm (DIN, German Industry Standard) or the European Norm (EN). The universal tool for the engineer is the CAD that completely ruled out the classic drawing board and the tusche box: Changes can be done much faster using the computer, standard parts like screws, springs and nuts can be taken from libraries and bills of material can be derived directly from the drawing. A looping coaster like Typhoon consists of thousands of single parts - a really complex "puzzle" making high demands on the designer. There is no apprenticeship or degree for roller coaster engineers, this job rather is a mix of interdisciplinary competencies regarding steel construction, mechanical and electrical engineering. "Today you work on the cars and tomorrow's task is to design the sole", Josef Herzog outlines his areas of responsibility. After completing the specification of the car the design of the layout begins. In a first step this happens only regarding the forces affecting the passengers, being extended to the steel construction itself in later stages of the process. The engineers aim to turn the basic idea into a layout that obeys the state of the art. Stability proofs have to be adduced, safety devices constructed and components dimensioned and developed. A network of steel pylons keeps the coaster together and draws the highly dynamic loads out to the earth. Adequate instructions for the production can be derived from the mathematical calculations. A roller coaster is supposed to push the limits and to comply with the safety standards at the same time. Safety is put in capital letters when building amusement rides, so the manufacturers cooperate with TÜV from early on, starting at the first development phases. The layout is the geometrical sketch of the track. It shows the exact sequence of the ups and downs and the inversions. The graphics consists of a ground view and an unwind of the track. The ground view shows the track layout by aerial view. The unwind of track shows the track unrolled in a plain view. Especially the height progression is visible. Also technical information (inclination, distance of columns, ...) are given. The 3D-layout is a combination of ground view and the unwind of track. It is used to visualize the track layout and does not consist of technical information. The layout is part of the design process and the cinematic/kinetic result of the track calculation and configuration. This field of activity - called dynamics - considers speed, accecerations and forces (e.g. created by acceleration of train). Stengel engineering office makes the calculations in relation to the riding people, the car and the track to appoint the maximum forces. This calculation is the basis for the force compatibility for the riding people and the design of steel structure. Nex to layout and dynamics, the static is the third sub area of roller coaster design. The column constuction and the steel sole is designed to absorb the dynamic and static forces - sometimes multiple tons - and the self-weight of the steel structure. The efforts regarding safety are shared by the Stengel engineering office in its history of almost 40 years: The graduate civil engineer Werner Stengel is called "Master of horror" and was involved in around 600 roller coasters worldwide. The field of activity of his team, consisting of ten employees, comprises the exact design of the layout on the basis of dynamics calculations, includes statics and the computation of the foundation loads. Gerstlauer, too, avails the services of the Munich-based engineering office that has worked for all renowned coaster manufacturers. The starting point of all considerations regarding Typhoon's layout was the rough design of the sole and the unwind of the track, two points the wire model for the presentation at the trade shows was based on. "Our vision is clearly defined by giving a layout to the Stengel engineering office", Siegfried Gerstlauer tells us. "In addition, there were pilot surveys regarding the car prior to the allocation of the project, determining the maximum forces and the minimum track radii." A clear interface definition fixes the cooperation from the beginning: "The further design of the cars as well as the layout have to adapt to that", Siegfried Gerstlauer comments. Engineering office Stengel optimizes the track at the computer, using elaborate numerical algorithms to keep the forces on the passengers below a limit. Every change in direction causes an acceleration , and every coaster has lots of them: Bends, drops and inversions are analyzed to keep them ridable. Stengel can count on an extensive amount of experience. Keywords like heartline and spline curves play a lead role when finding the ideal position of the track in space. The amount of data is so huge that it can only be handled by self-made software - The calculations for Typhoon would need 57.000 pieces paper. 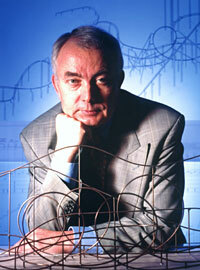 "Without the use of computers roller coasters couldn't be designed nowadays", Andreas Wild of the Stengel engineering office tells us. 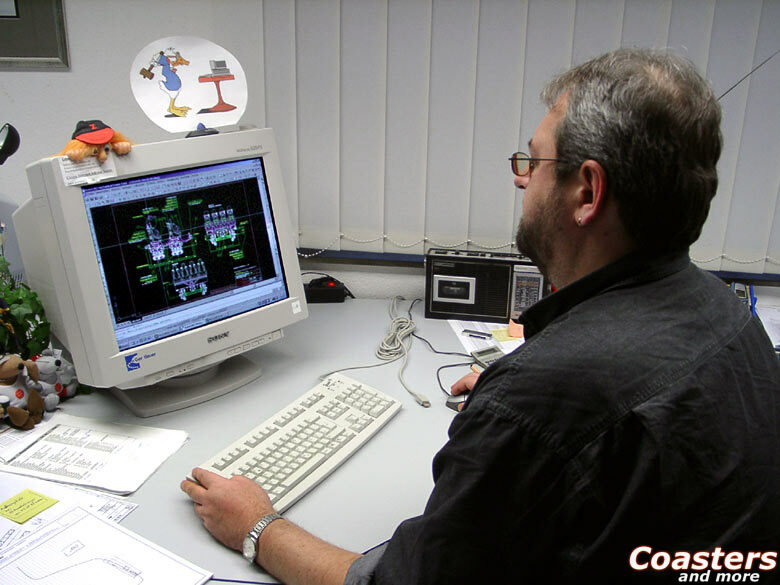 "Especially the development and implementation of our program for spline curves enabled us to design coasters running ultimately smooth and to give precise instructions for the production to the manufacturer. Regarding the very short development times these days we have to use highly modern tools to calculate the rides." More than 3000 hours of work have been done at the Stengel engineering office just for Typhoon. Here, too, modern 3D-CAD systems help the engineer to sound the limits of biodynamic tolerances of the passengers. A simulation of the coaster can be done based on the CAD data, and so the forces and the dynamic behaviour can be determined way before a prototype has been built. The roller coaster is virtually assembled early in the design phase to test functional relations and mechanisms. The production data (CAD files and other lists) represented by 3D coordinates and production directives for track, supports and sole are sent to the manufacturer electronically. "In principle we can start producing directly from the data we get from the Stengel office. But mostly we adapt the data to the local factors at the track manufacturer's site", Siegfried Gerstlauer explains the process. Track production happens, depending on workload, "in house" or is passed to a third party. After five months Typhoon was designed to the last detail, so the steel construction as well as the production of the cars could start in summer of 2003. Typhoon - a roller coaster emerges will be continued. Read and see in our next issue how the single components of the looping coaster Typhoon have been produced at the Gerstlauer facility. Many thanks to Gerstlauer Elektro GmbH and Stengel GmbH for the friendly support on realizing this article. The copyright for the pictures belongs to the photographers and the Gerstlauer Elektro GmbH, Stengel GmbH and Andreas Fechner, respectively. Publishing, distribution and copying without written permission is strictly forbidden.